Sorry for the break in service yesterday, but the real world got in the way of my regular Arsenal blogging duties. It doesn't appear that much has changed. We've not seen any additions to the squad, nor any departures... yet. Why not start with some good news? 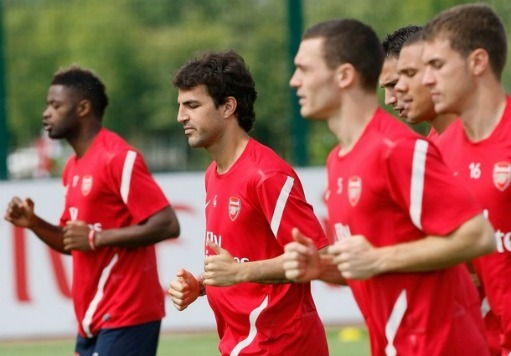 Well that would be the return to fitness of Robin van Persie, Thomas Vermaelen, Kieran Gibbbs and Theo Walcott. Arsene Wenger also said he expects Aaron Ramsey and Andrey Arshavin to be available following their substitutions through injury during the international games on Wednesday night. The manager didn't reveal whether Laurent Koscielny would be available however - however media reports suggest he will be in the squad - and Abou Diaby still remains on the sidelines following his ankle surgery. There is still a lack of news over the injury to Jack Wilshere. The manager says the midfielder is now wearing a protective boot for an "inflamed ankle" with no exact return date. This situation reminds me too much of the updates we were given over Thomas Vermaelen. Let's hope Jack makes a quicker return to fitness than the defender did. With the manager talking to the official site yesterday ahead of his 9am press conference this morning, we've been offered a bit more insight into his thinking over the situation surrounding the futures of Cesc Fabregas and Samir Nasri. "We hope it will be sorted out very quickly one way or the other. We’ll know very quickly. "The Nasri situation is stable. Again it is very difficult to speak about possible transfers but we are in a situation where we have to make decisions one way or the other. Ideally you want it to be sorted out before the season starts." It seems likely that neither players will start the season with the club. There has already been rumours that Fabregas has cleared out his locker at London Colney, but then he's already done that several times before only to remain with the club. However I think this time it is different. I've been one of those who fully believed the club would stick to its guns and not deal with Barcelona until they matched our valuation of the player. However it's appeared more and more likely Fabregas will be off for a lesser fee than I expected Stan Kroenke and Ivan Gazidis to demand. I feel the club has probably done it's best to reach a price level where it feels we can adequately replace the captain with a player of similar quality. And to think that Barcelona were offering us £20m to take Cesc off our hands! Unfortunately for me, whilst I appreciate Cesc has been a very good player for us, his actions and attitude this past few months have soured my opinion of him. Perhaps over time my feelings towards him will mellow, but I've not been impressed with everything I've heard him do to agitate for a move ever since his injury at the back end of last season. Then we have the Samir Nasri situation. He sat down last October and gave the club every indication that he'd sign a new contract, only to stall at every opportunity, making Arsene Wenger look very foolish every time the media asked him whether the deal had been done at his weekly press conferences. His move to Manchester City looks set to go through, after the club's board told Wenger that it would not be in the club's best interests to turn down the cash for a player who would not be signing a new deal next summer and would leave on a free transfer. I hope like the manager these deals can be sorted out sooner rather than later but I don't think we should put any time scales on these moves. Especially after all the media time scales have been totally off. So who will replace Fabregas and Nasri with? Juan Mata has been talked about all summer and into the frame yesterday came Shakhtar Donetsk's Jadson. The Independent seem to think the Brazilian's move to north London is a done deal, I'm not so sure about that. And then of course the central defence, that also need straightening. Scott Dann is the name no in the frame, but as I've said previously, I don't expect the club to do a deal until the last week of the transfer window, so to get the best deal possible. Dann's manager at Birmingham Chris Hughton has said we've not made an offer for the defender. Other possible transfers away from the club could include Nicklas Bendtner. Stoke and now Newcastle are in the running for the Danish international. "It is important that supporters and everyone at the club remembers that the cannon on the chest is more important than anybody." The manager speaks to the world at 9am. It's going to be something you won't want to miss. Join me on Twitter for that, otherwise stay tuned to the blog for the latest.